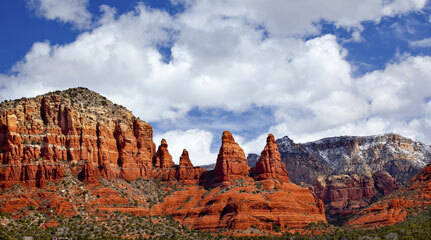 Load up the minivan and head to Sedona for your next family vacation. We know what it's like traveling with kids, especially by car, but unlike many road trips, locals will tell you not to worry about making a long drive to get to Sedona, or trying to sightsee along the way. Just power through the time spent driving and get to Sedona as soon as you can; this is where you'll relax, especially if you arrive at least an hour before the evening's sure-to-be-glorious sunset. There is a host of family-friendly hotels and accommodations awaiting your family's arrival in Sedona, each meeting most parents' and kids' top criteria: budget, location, elbow room and amenities. Budgets are subjective, of course, but we're willing to bet that a family on vacation will always appreciate getting a good value no matter how much or little they spend. Consider whether the hotel or motel includes breakfast, or offers free wireless internet access; value-added amenities like that can save a family around $25 per day. There are budget and family-friendly hotels throughout Sedona, but two good places to start are the Village of Oak Creek (not to be confused with Oak Creek Canyon) and West Sedona. In general, you'll find that familiar pocket-friendly hotel and motel chains as well as lower-priced singular hotels are located in both West Sedona and the Village of Oak Creek. Our Sedona hotel guide offers a quick look at each hotel's price range and displays them on a map, or you can use our Sedona hotel finder to sort by location and real-time rates for your particular vacation dates. If you're traveling with tweens, teens or with another family, you may want to find accommodations with some extra elbow room. There are several hotels with suites available, but Sedona is fortunate to be able to offer visitors vacation rental homes as well as several timeshare or vacation ownership resort options as a spacious alternative. Particularly attractive for a 3+ night stay or longer, a vacation home rental or timeshare resort rental is a great solution for families on vacation, even if you're not a timeshare owner. Search the web for vacation rentals by owner to find vacation rentals, and familiarize yourself with Diamond Resorts, Sedona Pines, Poco Diablo, Los Abrigados, Arroyo Roble, Wyndham, Hyatt and Hilton resorts for accommodations ranging from one to three-bedroom condos or suites. Let's face it: the kids will be tickled "red" if you choose a hotel with a swimming pool—either a heated outdoor pool you can use pretty much February through November, or an indoor pool like the one at Villas of Sedona. Particularly refreshing upon your first afternoon's arrival, especially after a long(ish) drive, the hotel's pool is the perfect place to head immediately after you drop your bags in the guestroom. Let the kids swim and tucker themselves out while you enjoy poolside refreshments and towering red rock views; the crimson color gets cranked up to the max in the setting sunlight. Enjoy a good night's sleep in your budget-friendly, perfectly located, spacious accommodations because there's a whole lotta family-friendly activities to explore on your Sedona vacation! Today, on average, young people are spending 4 minutes a day in the outdoors, and, it is said, 6 hours a day in front of a television or a computer. Sedona is a phenomenal place to reverse that trend and get young people – in fact, all people – into the Great Outdoors, as part of a healthy vacation itinerary. While it's not the most obviously family friendly destination - in fact, part of Sedona's appeal may just be that there are no theme parks, arcades or sprawling malls - Sedona is a great place for families traveling with kids, IF you know where to look. First, there are plenty of tour operators that will expertly help you get into the surrounding canyons by jeep, horseback, all-terrain vehicles or even a train or a hot air balloon, and the guides will gladly tailor their narrative to fascinate kids and pique their natural curiosity. Second, venture out on your own; independent activities such as hiking, golf, fishing along Oak Creek, or swimming in the creek at Slide Rock or Grasshopper Point are the stuff that childhood memories are made of. In fact, kids aged 6 - 12 can complete the Junior Ranger program at Arizona State Parks like Red Rock and Slide Rock State Parks. If you need further specifics on where to go, look here or ask a local; most of Sedona's residents are open-air enthusiasts and will happily point you toward quiet locations where your kids can explore nature. Third, if you can't separate your tween or teen from her smartphone, make it work for you! Put your kiddo in charge of taking photos with the cell phone camera during your vacation. He can even try to complete our Sedona Photography Challenge and share your pics with us on Instagram! One thing parents often hear when traveling with kids is the whine of "I'm huuuuunnnnggrryyyyy!" Faced with the challenge of finding kid-friendly places to eat at least three, and sometimes more, times a day on your vacation, you are wise to look in advance for restaurants and eateries that cater to families. While it's certainly true that most places in Sedona will welcome you and your progeny, why not check out these especially kid-friendly joints that offer a decent array of choices on their children's menus, won't break your budget (probably), and will keep the kidlets entertained long enough for you to actually take a rest, maybe have a cocktail, and enjoy a meal yourself. Insider tip: If you're staying a couple of days and your lodging has a fridge and/or microwave in the guestroom, make an early stop at one of the local grocers like Safeway or New Frontiers Natural Marketplace to stock up on some kid-friendly snacks and maybe even a simple ready-to-eat meal or two. You'll be happy to have fresh goodies and drinks on hand to not only keep up your sightseeing energy, but also avoid having to eat every single meal in a restaurant. Travel by Jeep through Sedona's rugged countryside toward Soldiers Pass for expansive landscape views. This tour also brings you to two interesting natural sites: Devils Kitchen sinkhole and Apache's Seven Pools. Sedona's oldest continually owned family tour business (since 1949) offers a wide variety of tours, including: Jeep tours, horseback rides with BBQ cookouts, winery/jeep combination tours, and much more. In Sedona we are known as the fun and friendly tour company, and we've got a reputation to back that up. Let our Cowboy and Indian guides show you what's special about Sedona's high desert. Check out our website for savings on online bookings. Enjoy expert commentary and air-conditioned comfort Don't forget your camera for endless photo opportunities! A combination 4x4 and helicopter tour of the Sedona Red Rocks let you see the most spectacular views of this famous American landscape. Fly through canyons and get up class to archaeological cliff dwellings on a helicopter tour that takes you beyond anywhere accessible by land, followed by a 4x4 off-roading tour for a rugged on-the-ground trip. Plus, a guided commentary provides insight into the area’s archaeology and wildlife as you go. This 50-minute helicopter tour over the Greater Sedona Area is dream flight for photographers. The canyons, rivers and desert sprawls painting this journey make it one of the most striking aerial excursions in America. Among the sights you'll see, historical markers include one of Butch Cassidy and the Sundance Kid's hideouts as well as the old mining town of Jerome. Take in aerial views of Sedona's mountains and ancient sites on a 25-minute helicopter tour that goes deep into Red Rock-Secret Mountain Wilderness. Soar above Rattlesnake Mesa and see the cliff-side homes of the Sinaguan people as you explore a landscape split by deep canyons and crevices. Capture unforgettable images of Sedona�'s unearthly rock formations as you fly past Bear Mountain, Fay's Arch and Doe Mesa, and enjoy sweeping vistas of Arizona's dark pines and vibrant cliffs.